We're finally reaching the point where gamers can create entire outfits simply by using videogame pack-ins and pre-order bonuses. Since the videogame pre-order bonus was first conceived, I've been compiling an outfit that consists solely of free videogame goods. 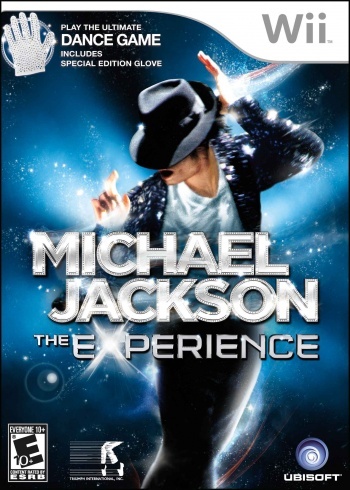 This week, Ubisoft announced that the Wii version of Michael Jackson: The Experience will initially include a hand covering to add to that outfit in the form of Michael Jackson's sequined glove. Michael Jackson's glove is just one piece in his iconic line of apparel that he wore through the years in his rise to become the King of Pop. It'll be in specially marked packages that will cost the same as the regular version of The Experience, but the glove is exclusive to the Wii and won't be packed with the Xbox 360 or PlayStation 3 versions. I would rather have the red leather jacket from Thriller, but you've got to start somewhere. This glove is just another addition to the mass of videogame garments that publishers have been using in recent years to get us to want their products. The most common has been the t-shirt, often displaying horrifyingly ugly graphics and distributed in extra-large sizes only. Game retail employees have plenty of shirts to sleep in, let me tell you. Certain companies have been developing bonuses that cover other parts of the body, such as the Scribblenauts pre-order rooster hat and the Lucha Libre masks that were recalled so they wouldn't make kids die, but an entire half of the body has gone largely ignored. What we really need now, videogame publishers, are pre-order garments that cover the lower halves of our bodies. I'm talking pants, socks, and underwear here. They don't have to be spectacularly made, but it'd be nice if people could dress in clothes that they only got at GameStop and Best Buy. Circuit City once offered free camouflage boxer shorts with the purchase of Conflict: Denied Ops, but we haven't seen nearly enough of this as we need to. I'm not sure if I really want to wear Michael Jackson's sequined glove for fear that it'd be haunted and make me grab private areas in public, but it certainly goes well with the videogame pack-in outfit I've been composing. Now if Gearbox would just listen and give me those Duke Nukem Forever Wranglers I asked for.